I received a a link to an SG50 song submission that was ultimately rejected. It wasn’t, however, rejected because it was a bad song. In fact, it’s pretty good. Trust me, go ahead, and have a listen. What I like about this song is its focus on the what it means to be Singaporean. It didn’t just recognise our unity, but our shared history. This song is saying exactly what we all need to hear now: Be United. It’s also a timely reminder of the steel required to forge this island. 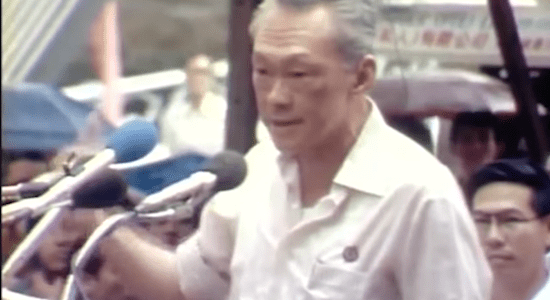 While some people might despise Lee Kuan Yew, we have to remember that this man led the turnaround. The country went from an island abandoned by Malaysia, to an island state respected by those who once viewed it as nothing. So, why was it rejected? I was told that it was rejected because it wasn’t written by a Singaporean. I didn’t want to let a song go unlistened to, just because it was not written by a Singaporean. I think there’s a lot at stake in the coming few years. How we treat each other and how we accept the differences in opinions will make all the difference. In other words, our unity will make a severe difference. Its message is exactly what Singapore needs to be reminded of, right now. This song could and probably win tiis competition……just because it’s written by a non Singaporean. Really small minded whoever made that decision. Can’t a foreigner love Singapore? We are multiple-nationals, the more we should rejoice that a foreigner recognize Mr. LKY & his contributions to this country, & also what we need now : AS ONE!!! Lyrics was nice to listen to and sing along. Music arrangement was exclusively good. My take is, “Music is an international language”. When we look at what Singapore was before and grown to what is now, i think that whoever wrote the lyrics and the music arranger, they should be give credit for doing it. It shows that their interest is far better then some Singaporeans themselves. It’s a beautiful song. As a musician i would say i hope it would be reinstated..this song touches my soul as a singaporean..good lyrics.. Great chord structure…moving melody..
A very meaningful song. Well done. This SG50 song competition is open to everyone to write about Singapore so I think it should be fair to other people or races who feel they are part of the country and would like to contribute. Being Singaporean is the message. But “Being Selfish Singaporeans” is the reason why it was rejected. Its saying silently, “YOU’RE NOT ONE OF US!”. What a joke, this song beats ANY OF THE SG50 SONGS!!!! All of them combined doesn’t even have the power of this song. Simply love it! It’s as if we want foreigners around but then also want to deny them of any emotional connection to Singapore. We aren’t a global city until we accept that other people can love Singapore too. I absolutely love this song. The lyrics speak to us and reminds us that we have come a long way by doing exactly as it said. I am not a Singaporean, but have grown up in this country since 5 years old. I have come back with my children because of the values I’ve learnt and know that my children should have the same priviledge as well. Well done fr this song and I will definitely want everyone to hear it! I’m glad you do, Angel! I actually received a lot more positive feedback on this song than negative one. Generally, there’s a very good vibe to this song! This is one of the best song, compare to the rest. If the song rejected is due to the reason he not Singaporean, then why we still accept foreign to come in Singapore and become a citizen here. Why still employed so many foreign talent to help Singapore economic and sport games. When I hear this song, it straight away catch my attention. Which the rest are not. The lyrics are good, musics and structure was prefect. All the meant were there. Really not sure why still be rejected. Maybe don’t have the word Nation.”One Nation”?????? If really that reason( non Singaporean) rejected, I think we are really selfish as a Singaporean. Yet the competition is open to everyone. should be fair. I will share this song with my friends. I agree that we’re being selfish to reject the song. Moreover, I think we should be more open to others, since we’re a global city already. Song was written by a team comprising of Singaporeans and non-Singaporean. Rules did not rule out this combination. So it was rejected for the wrong reason. My daughter happens to be part of the team. I worked with your daughter before, so I know she’s definitely 110% Singaporean :)) The song was definitely rejected for the wrong reason. Thank you very much mr, Kenneth lee for posting the video and song. The video is edited by my son Isaias ZAntua. 1. The footage that extracted on Mr. Lee ‘lecturing’ the on strike scene without letting lots of younger generation knowing the background resulted that Mr Lee appeared to be very ‘hostile’ in a ‘fixed’ image. 2. The footages that used do not ‘covered’ rich enough of the independent’ essence of the nation. It could be used in any ordinary national day but don’t forget, this is SG50. I wish it were the case that the song was rejected because of the footage. The problem is that the footage itself was not the issue. The song was rejected solely because it was composed by a foreigner. wow.. i almost cried listening to this song, its fantastic. not only are the lyrics meaningful, the music is soothing to the ears. it certainly hit a spot. will share it. Thank you Jamie! Glad to know you like it. Do come back for more on my blog! I think it’s nice and simple. It’s an irony that this song didn’t win because it’s not written by a Singaporean…then what do we say about those medals won for Singapore by the Chinese PR?? I think the fact that this song wasn’t even considered to run says a LOT about how we view winning, success and value as a nation. I really like this song and this country as a foreigner I feel Singapore might be the most special country in the world. I really respect LKY and how he has turned this country which started as a third-world country to Asia’s only first world country. What I don’t get is why do native Singaporeans hate him so much? Why do they hate PAP? What has he done wrong? Why do you think Singaporean passport is one of the best passports in the world even when its considered one of the the most totalitarian governments in the world? A friend once told me, that Singapore is a dictatorship but the most benevolent dictatorship in the world. I think that sums it up, the Singaporean people have been blessed with a chance to think and to choose freely where they travel and what they do, guys think about it, you could pay 1400 sgd(eva airways, 2months at least booking time) and book a return flight to seattle and have all the weed you want and all the other drugs that you can get there,you won’t be stopped, you won’t be questioned or you could live a life eating from hawker places and working hard and doing your best travelling on MRT to reach the level I mentioned above. I love this country for having that choice, I love this country for giving me that choice. Thanks Soul Hacker. It’s good to know that there are people who love our country the way it is! Perhaps the organising committee need a reminder that 3 of our national day songs were written by a Canadian? Is a great piece of song. However, if this win, people will critise foreign talent took over Singaporean again. The anti-FT, anti-foreigner extremist brigade on the internet (TRE, Hardwarezone, Yahoo etc) is very very vocal, and with a deep and penetrating network of contacts. These people know how to whip up anti-FT sentiment in less than 2 clicks of a mouse. No one, least of all the SG50 organisers, would want to be a target. Worst of all, anyone who stands up against them gets unfairly labelled and CSIed. Too much of a risk. I take that risk knowing that I’m not doing the wrong thing, and that I’m not unreasonably supporting any FTs. I know the person who runs the production house that did this song, and I can safely say she’s Singaporean. Come what may, i think we did our job: To share and make sure more people see this video. hi hi i love this Song so much… our minister shared this song on PAP facebook page already, do u know who is the singer? lovely voice!!! Not sure actually! I’ll ask the producer. hi kenneth, if its not too much trouble i would also love 2 know the name of this FT who wrote this song….cheers!! omg so secretive ah… nvm i go ask minister wong to check… haha..jokin! gd job 4 sharing this Song! Nice song, but I think we should look at why it was rejected in the first place. We cannot fault the organisers. I believe many will be able to predict what will happen if some competitions like this is won by other nationalities. You will see the government, organisers, Mr LKY, PM, MPs etc. Everyone related to politics are gonna get flamed. You know what? This is the perfect song for SG50! So sad it got rejected. This song is very meaningful and touching. We shall all petition for the acceptance of this song and to be aired on the media.. Indeed a lovely song – Simply worded, easy to remember and yet cut into my heart together with the accompanying video. Caused a lump in my throat. What a pity this song is rejected. Since the song was submitted for a competition, I suppose we’ll have to respect the decision of the judges, regardless of the reason or the lame excuses they give. On the other hand, I am thankful that the internet has made it possible for this marvellous piece of work (audio and video) to be shared with the masses. Years ago, there were complaints against National Day songs being too cheesy, and a song from the alternative genre was selected. I appreciate the variations of the different NDP theme songs thereafter, and enjoy them as great works of music, but personally, I think National Day songs should bring people together, and remind us of our identity and goals as a nation. In that sense, I still subscribe to the old school “We Are Singapore”, ” Count On Me Singapore”, “One People, One Nation, One Singapore”, etc. even though many of the younger generation see those songs as cheesy. In my view, ” As One” has captured the essence of the Singapore spirit masterfully. The music is well written and arranged, with great vocals and tastefully edited video to go along. Thank you for making it available on YouTube. My work overseas requires me to introduce Singapore to the local population (adults and school children), and I would definitely like to show this video link to them because it really showcases what Singapore means to me. John F. Kennedy said, “Ask not what your country can do for you but what you can do for your country”. Kudos to the team behind this song! To the Singaporeans in the team, you have done a great service to our country and I salute you! To the non Singaporean(s) in the team, thank you very much for your work and contributions to making this great song available for Singaporeans as we celebrate our fiftieth national day this year! Contrary to the reason for rejection as given by the judges of the competition, there are many Singaporeans whose hearts are big and wide and we support you! Thanks you for the very kind words! The team that made this song will definitely hear this. I wasn’t following home news and only got to find out from my friends yesterday that the finalists have already been picked. I saw the entries on YouTube and while the three finalists wrote good songs, I’d have to be honest that none stirred strong emotions in me like “As One” did. Even my non-Singaporean wife felt this was the most suitable song for NDP. The team’s efforts have not gone wasted. One request: I would definitely love to pay to download both the audio and video for keepsake, as well as to show my support for the team so if this piece of work is available for sales online, I’d greatly appreciate if you could drop me a notification. The team should be recognised for their hard work! i’m curious please. Did the competition organiser explicitly and specifically say that this was rejected due to being composed by a non Singaporean? Beautiful lyrics, good melody & angelic voice. Most importantly brings out the real Singaporean that you could share/relay to the whole world. Why can’t they accept tt not many Singaporeans has really a good voice. The writer has seriously inspired by the country & singing makes him more Singaporean. Anyhow rules r rules. All we can do is shared the song to everyone we know & be inspired. I like it. Much better than some of the other sub-standard entries. However…..maybe the point was to groom local talent and therefoee they want to keep it to local….though if it wasnt mentioned in the rules in tue first place….it is unfair for them to reject it. Who is gng to refund the guys for all their hardwork and time and effort? Hi Kenneth, I’m a reporter and would like to get in touch with the producer of the song. Could you put me in contact? What a pity, but then again, l can respect the perspective from the judges. If you recall, Joseph Schooling won a medal for the country at the Asian Games and the next thing you know, people started asking if he was born here. His father had to do some media briefing and show his birth cert to prove he was a true Singaporean. Personally I find this state of affairs insulting. Sigh, its a sign of the times. I came to Singapore in 1966., married a Singaporean and have lived here ever since. Although my husband has since passed away, I have not had the desire to go “home”. This is my home and I love it here. The song is the best I have ever heard and it brought tears to my eyes. Thank you for sharing. This song is truly awesome & I just love it…every bit of it. My heart beats to its melody and brings tears to my eyes.